Planning to major in German? Germany is Europe's largest economy, so why not consider a German/International Studies double major to prepare for a career with an international firm? Or you could combine your German major with our teacher certification program to prepare you for teaching at a high school. 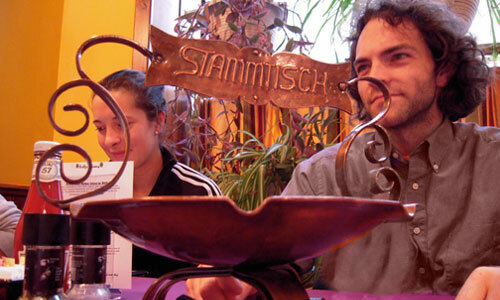 Of course, you can also study German simply for the love of the language and its culture. We keep classes small so you can work closely with your professors to master your conversation, writing and reading skills. Outside of class you'll have fun taking trips to a local Oktoberfest, the Bullfrog for Stammtisch, and even New York City for a German Opera and dinner with your classmates in Deutschverein, the German Club. When you're ready, you'll be off to Germany to study at our affiliate campus, Otto-Friedrich-Universitat, one of the highest-rated universities in Germany. For a list of German courses, please see our Course Catalog. a regular gathering of people (German Club) at the same table at the same establishment (Bullfrog Brewery) for a special purpose (to strengthen conversation skills). 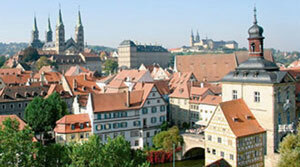 9,000 students turn the small, charming city of Bamberg, Germany into a thriving college town. You'll have numerous bars, cafes, discos and clubs to explore. Courses include all levels of German for non-native speakers, in addition to courses in a wide variety of fields in German. Choose to go during the Academic Year or over Sommersemester. Whenever you decide to go, you'll have convenient train and bus access to Frankfurt, Munich and Berlin. You'll also be close to the Alps, so if you enjoy hiking or skiing – you'll have it made. Think you might be interested in this program? Our Study Abroad section has more information.